Take control of your free time, cut your monthly expenses and enjoy your lawn all year round without worrying about extreme weather or temperatures. SYNLawn® Oklahoma gives you the freedom to appreciate your home like never before by upgrading your landscaping to include one of our premium blends of synthetic grass and installations. The reasons why your commercial facility should invest in artificial grass are virtually endless. Our synthetic turf has countless uses, including providing a lush landscape in areas where it is difficult to grow plants, where watering is a challenge and where high foot traffic makes it difficult to keep sod looking healthy. SYNLawn® Oklahoma knows that a parent’s number one priority is the safety of their children, especially while they are playing outside. When purchasing a playset for your family, the ground that the playset is set upon should be carefully considered as well. The vast majority of playground injuries happen as a result of falling on hard, abrasive and unsafe surfaces. 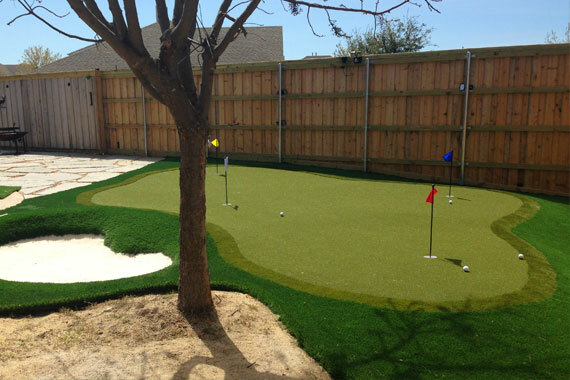 Bring home the game you love with a backyard putting green from SYNLawn® Oklahoma. Perfect your short game with SYNLawn precision putt artificial turf which provides a stimp of 10.3-10.4 without any sand!!! And chipping unlike anything you’ve seen before. Our putting greens are robust and stand up to extreme weather, high foot traffic and repeated shots without dents or damage. We understand that pet owners want only the best for their furry family members. Because pets come in all sizes and breeds, every pet owner has different needs. SYNLawn® Oklahoma’s artificial pet turf experts can help you select the right blend of artificial grass, installation techniques and maintenance. SYNLawn® Oklahoma is excited to provide Oklahoma City and Tulsa residents with the highest-quality artificial grass for a multitude of applications. 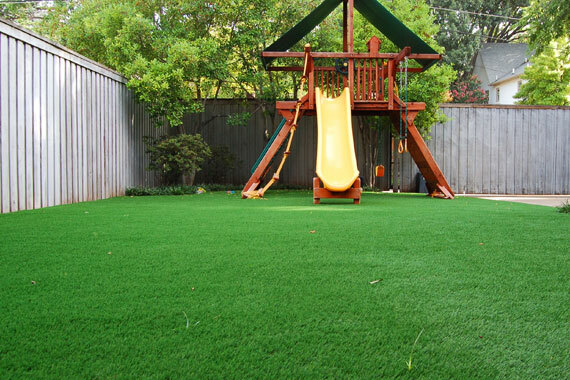 We offer more than 40 different kinds of synthetic grass to meet and exceed all of your fake grass expectations and needs. Our affordable pricing ensures you can create the lush, green space you have always wanted! 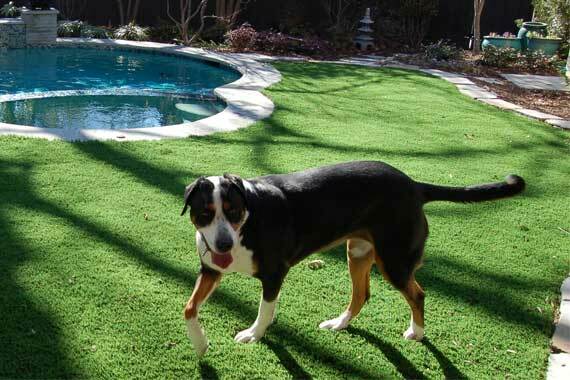 When you purchase artificial grass from SYNLawn® Oklahoma, you are investing in a long-lasting, durable and beautiful solution to many of the problems and issues that accompany natural grass lawns, pet areas and golf greens. Regardless of the weather, our synthetic turf stays green all year long. You never need to worry about your grass turning yellow or brown from pet waste, and SYNLawn turf will hold up better to foot and club traffic better than natural grass. Save money and time by contacting Oklahoma’s premier artificial grass provider. Our products are backed by a 15-Year Warranty and are made from 100 percent recyclable materials, making them safe for the whole family to enjoy, including your pets. Whether you want to design and install a backyard putting green to work on your short game or transform the landscaping of your commercial area, SYNLawn® Oklahoma’s environmentally friendly grass will transform your space. SYNLawn® is the leader of artificial turf and installations, and has been part of the turf manufacturing process for over 45 years. Our group is proud to offer the residents of Oklahoma, SYNLawn® premium turfs and installations for residential and commercial projects. We have a fully staffed team including project designers and coordinators, commercial project managers and certified installers to assist you with your landscape transformation.